23andMe, co-founded by CEO Anne Wojcicki, has deployed its latest update, featuring interactive ancestry details, cultural insights about food, art and language, and the option to order a physical ancestry book. Starting today, customers will be able to see more granular ancestry results from more than 1,000 regions, as well as 33 population-specific pages about cultural information. Before this update, 23andMe simply said I was 12 percent British and Irish. Now, it’s able to break down where in the U.K. my ancestors likely lived. 23andMe, however, was not able to detect more granular data in Ireland. 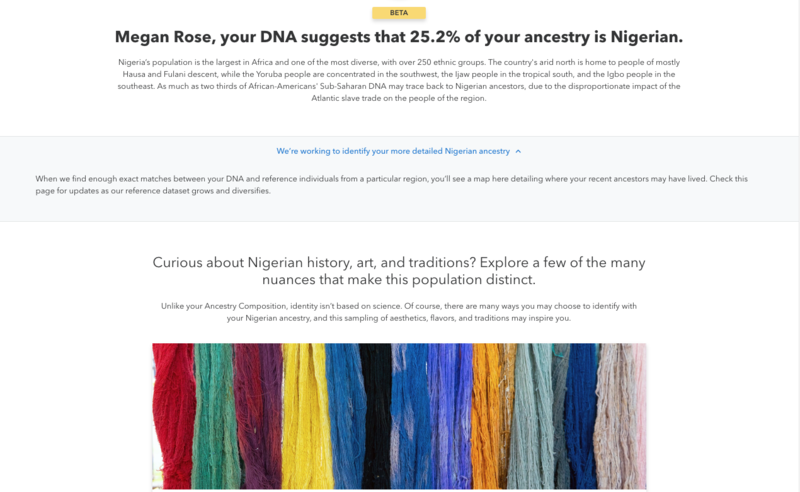 It was also unable to detect additional evidence in Nigeria, where 23andMe says 25.2 percent of my ancestry comes from. That’s likely because, even though 23andMe has made efforts to grow the number of African and African-American people in its data set, it’s still lacking. Though, it’s worth noting no ancestry service has it all. Generally speaking, customers who share exact matches between their DNA and reference individuals from a particular region could potentially see granularity in regions of Anambra, Edo, Imo, Lagos and Ogun State in Nigeria, 23andMe spokesperson Christine Pai told TechCrunch. It’s worth noting Ancestry says just 1 percent of my DNA comes from Nigeria and that the bulk of my African ancestry comes from Cameroon and Congo. But when I first signed up for Ancestry, the company said 39 percent of my ancestry came from Nigeria. This is all to say that these tools are imperfect and always subject to change. And, depending on where the bulk of your ancestry comes from, it may change dramatically. This is problematic, given many people turn to these DNA testing tools to figure out more about who they are and where they come from. I’ll keep this brief, but I was pretty frustrated when I went from thinking I was very Nigerian (39 percent, according to Ancestry) to barely Nigerian (about one percent, also according to Ancestry) to then again a fair amount of Nigerian (25 percent, according to 23andMe). I asked Dr. Raff if DNA testing is just a load of crock, but she said it’s not. But that’s not entirely the fault of 23andMe and Ancestry. In order to be as accurate as humanly possible, these companies would need to sequence every person on the planet. That’s not currently feasible, so in the meantime, Ancestry points to its confidence levels. “We take this pretty seriously and we do want people to understand what is something they can put money in the bank on, and what they should take with a grain of salt,” Ancestry Chief Scientific Officer Catherine Ball told TechCrunch back in September. She added that Ancestry tries to be transparent about confidence levels. And, in Africa specifically, “it’s one of our most exciting opportunities and greatest challenge” due to the enormous amount of genetic diversity on the continent. Additional reporting by Sarah Buhr.